Side sleepers often have it rough. With all their body weight falling on their hips and shoulders, it can lead to restless nights and uncomfortable mornings. It is possible to reduce the discomfort associated with side sleeping by adjusting one’s posture, mattress, or arm positioning. However, even with all these adjustments, it can still lead to hip pain and nerve pain if you sleep on your side continuously for years. It’s also possible to remove these factors of pain and discomfort simply by switching sleeping positions. Sleeping on the back, for example, allows for body weight to be distributed much more evenly throughout the bones, joints, and muscles. Unfortunately, some sleepers just can’t get as high quality of sleep on their backs or stomachs as they do on their sides. Luckily, there is something you can introduce into your sleep arsenal that can ease pain associated with side sleeping and make things feel much more comfortable: the knee pillow. An orthopedic knee pillow is specially designed to relieve side-sleeping pain or discomfort and is available online with many different options. The best ones can make for a great night’s sleep. But how do you know what knee pillow is right for you? This ergonomically designed knee pillow will comfortably fit between your legs, providing maximum support and comfort. This will help relieve pain caused by the sciatic nerve. The 100% memory foam provides lasting comfort throughout the whole night. The ComfiLife memory foam is responsive to both heat and weight, adjusting as your body temperature and position do as you sleep. It can be used in a variety of different positions in order to meet many different postural needs. It is covered with a polyester zippered fabric that helps keep the cushion cool and makes it easy to wash when needed. 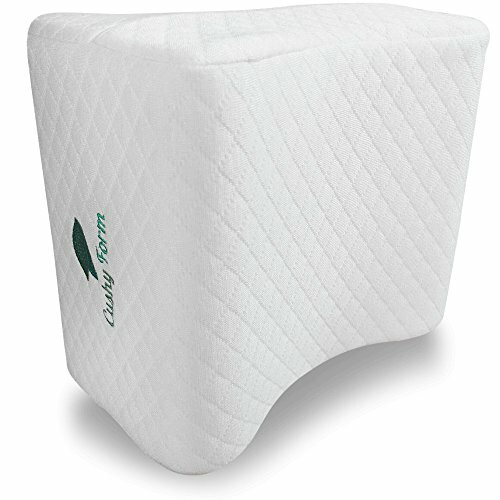 If you’ve done any research into pain-relieving knee pillows, you’ve probably seen much praise for the Cushy Form cushion. It’s a contoured memory foam knee pillow with a washable, removable cover for easy maintenance and even easier sleeping. The foam relieves pressure from gravity on your knees, hips, and legs and distributes the weight more evenly so as to allow comfort all night long. It’s a perfect knee pillow for sciatica relief as it allows more circulation through the sciatic nerve areas. This product helps improve circulation and can be especially helpful for pregnant women or those recovering from surgery. 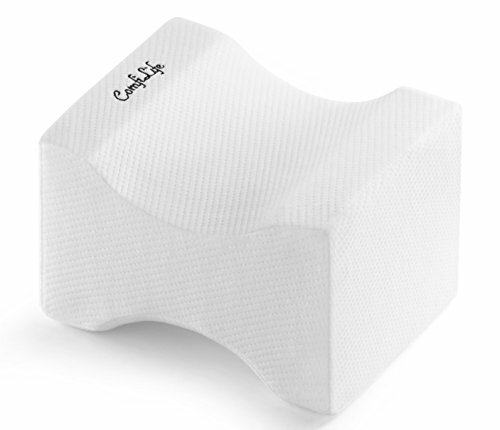 This memory foam knee pillow stands out with the strap that helps keep it in place. With the pillow in its proper place the whole night, there will be no more interruptions from your normal sleep schedule. The strap keeps it from slipping off but can be removed or used on the other side of the body if needed. 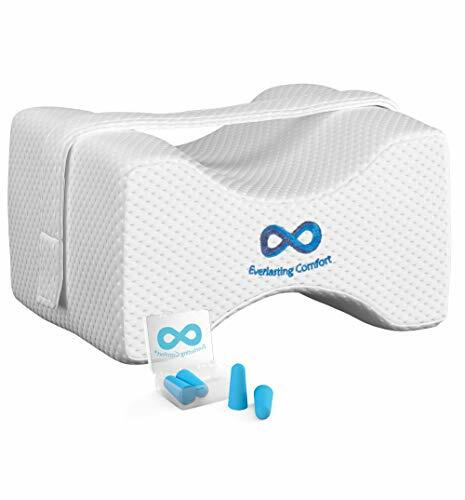 This one is made from 100% real memory foam, which memorizes the shape and weight of your body and surrounds those it with soft pressure and support. Unlike other stuffing materials, memory foam will not flatten out or lose its density over time. There’s an extra bonus that comes along with the Everlasting Comfort as well: earplugs. These earplugs are noise-reducing, shape memorizing, and travel-friendly with a portable case that they come in. 100% PURE MEMORY FOAM - Our memory foam cushion is 100% pure with no additives and is made from the exact same material as the world's best memory foam manufacturers. ERGONOMIC CURVED DESIGN - The orthopedic contour keeps your knees separated with ideal spacing and support to align your legs, hips and spine. Relief and treatment for knee, hip, leg and thigh area, pelvis, lower back, lumbar and spine, arthritis, bursitis, joint & sciatic nerve pain aka sciatica. Perfect for side sleepers and use during pregnancy. REMOVABLE STRAP - Our knee pillows are equipped with a removable and adjustable hook-and-loop strap that keeps the knee pillow in perfect alignment between your legs when you roll over while sleeping. No more hassles with readjusting the wedge pillow in bed, giving you an undisturbed night's rest! LIFETIME REPLACEMENT GUARANTEE -Your knee pillow is protected under our lifetime warranty and if anything happens we will send you a new one at absolutely no cost! You can sleep well from night til morning knowing you can rely on the help of Everlasting Comfort. One of Amazon’s Choices for side sleeper pillows, this Sciatic Nerve Pain Relief Cushion is a contoured memory foam that will elevate the upper knee, both supporting the top leg and alleviating the bottom one. Users say that the knee pillow starts out pretty firm but softens and follows your shape as time goes on. Reviewers have also noted relief from back pain, hip pain, leg pain, and nerve pain after using this pillow. The sciatic nerve, the nerve which runs through the hips and down both legs, can get pinched when kept in a side-sleeping position for long periods of time. This causes acute pain or discomfort, often waking up a sleeper because of the irritation. This is a great knee pillow for hip pain, as it’s designed to cut back on the discomfort caused by sciatic nerve pain, allowing side sleepers to enjoy their favorite position without all the drawbacks. CONTOUR KNEE PILLOW - This contoured superior memory foam knee pillow with washable cover allows for a comfortable all night's sleep by elevating your upper knee. The therapeutic side sleeper body positioner - encourages the correct posture by being acting as a spacer cushion in between your knees. No more restless nights! 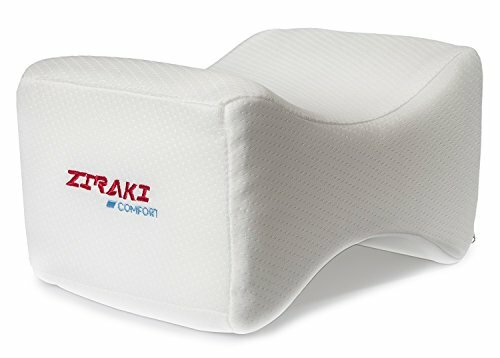 The Ziraki Memory Foam Wedge offers relief for pain in the back, hips, joints, legs and sciatica nerve. It also aids with spinal alignment, leg support, and acts as a great pregnancy cushion. The full money-back guarantee shows Ziraki’s strong confidence in their product. It’s designed specifically to fit in the space between your knees to provide maximum support. It works best when maintained at room temperature, as memory foam reacts to temperature, and it may get harder in cold weather and softer in warmer temperatures. Like most of the other options on this list, the Ziraki pillow comes with a removable and machine washable cover to keep things regularly cleaned. There are a few major factors to consider when shopping for a knee pillow sleeping. You want something that will lift your upper leg, provide comfort to your bottom leg, relieve any pinched nerves, and realign the spine into proper position. Support – The knee pillow needs to provide firm support to the leg it lifts up in order to provide relief to the lower one. Cooling – A thick buffer of cushion between your knees can be soft and cozy, but it becomes uncomfortable when that cushion makes you hot and sweaty. Some may offer cooling elements to help the sleeper remain fresh during the night. How Do Knee Pillows Help? These kinds of cushions can relieve pressure from all parts of the body, including the back, ankles, hips, and more. They do this by realigning the spine into proper position. Sleeping in the fetal position is actually the most natural and healthiest body posture. This is only true, however, when proper alignment of the spine can be maintained. This is where a good knee pillow comes in. It alleviates pressure put on your back and hips by gravity and distributes the pressure evenly throughout your body. As a great side effect, a knee pillow will also help to relax the hamstring muscles, which gives an overall relaxation to the body. Now you should have a strong idea of the criteria that qualifies a knee pillow as a good one. You understand the benefits they provide to the sleeper and how it works to provide those benefits. You even know about the top-performing knee pillows on the market right now. What’s stopping you from enjoying higher quality sleep, more comfort, and less pain? If you’re a side sleeper, consider trying a knee pillow today to see what you’ve been missing out on all this time.